At the bauma 2016 exhibition, which will take place in Mu¨nich, Germany, in April, SENNEBOGEN will introduce the new 870 material handler for demanding material handling at ports, scrapyards, or for industrial use. The newly developed product boasts a convenient safe working load of 8 tonnes at a maximum reach of up to 25m, as well as the innovative Green Hybrid energy recovery system. The SENNEBOGEN material handlers of the Green Line have proven themselves in demanding tasks across the globe with reliable technology, minimal operating costs and innovative, custom solutions for any challenge. standards, including automatic idle stop and EcoMode. A 250kW electric motor is also available. With equipment lengths up to 25m at a maximum safe working load of 8 t, the latest model in the current E-Series supersedes its predecessors with vastly increased performance. The innovative Green Hybrid energy recovery system is the latest development and is fitted to both the SENNEBOGEN 875 and the new 870. This system has been proven through initial customer use across the globe. An energy recovery cylinder mounted on the boom in between the two hoist cylinders offsets the weight of the boom, reducing energy costs up to 30%. This additional hydraulic cylinder stores the energy produced by lowering the boom in compressed gas cylinders placed in the rear of the machine. This accumulated energy is then provided during the next stroke. The principle is similar to a spring being compressed and then releasing its energy when it is allowed to expand. the operator a pleasant workplace with automatic air- conditioning and high-precision joystick control. The new material handler is available with a new option: the newly developed Skylift cab extensions allow access from the ground and views up to 15m with ease. This allows, e.g., the monitoring of loading operations into ship hulls, a valuable safety feature in port handling. The proven SENNEBOGEN modular concept offers an extensive range of superstructure variants to meet customer requirements. From a mobile undercarriage with 4-point claw support to crawler and rail undercarriages, to gantry and pylon solutions for special port applications, all can be provided as custom solutions. With gantry and pylon superstructures in particular, the SENNEBOGEN 870 achieves an outstanding viewing height for use in material handling.The custom modular system consisting of several undercarriage variants, various equipment lengths, cabs and cab extensions allows for more than 1,000 flexible combinations – the right solution for any challenge. engine offering service advantages. The SENNEBOGEN Control System, or SENCON in short, offers easy menu navigation. Machine parameters can be read out centrally on a generously proportioned, intuitively operated display, and the operator can conveniently make individual fine adjustments himself. 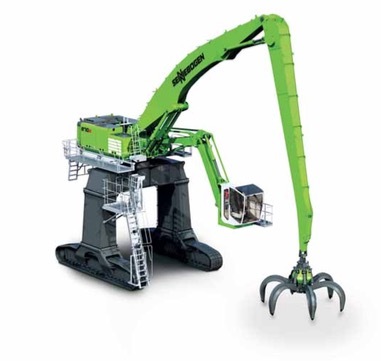 The new E-Series of the SENNEBOGEN 870 supplements the extensive range of Green Line material handlers for port handling and scrapyard applications. Versatile configurations are available for such operations, allowing the machine to be tailored to customer- specific requirements.